Written by Athenian playwright Euripides Bakkhai is a Greek tragedy and deals with the two sides of man’s nature. In the play the rational side is represented by Pentheus, the king of Thebes while Dionysus represents the instinctive side. Ben Whishaw shines in this production that goes by the traditional Greek practice of having three main actors play multiple roles. His Dionysus enters the stage and addresses the audience: “How do I look? Convincingly human?” From that moment on Ben Whishaw puts the audience under a spell with his brooding aura. He has an almost androgynous appearance – a delicate grace that is mesmerising to watch. At times he seems to be possessed, storming across the stage in rage. The next moment his expression resembles that of a cheeky little boy. It’s that contrast between innocence and pure fury that makes his performance so gripping to watch. 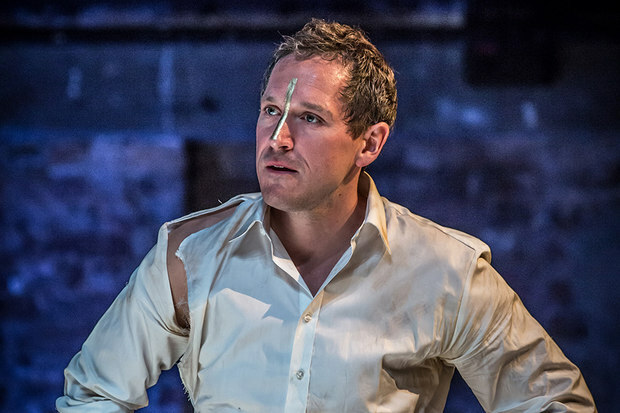 Bertie Carvel is just as convincing playing Pentheus. Dressed in a business suit he imposes political arrogance. 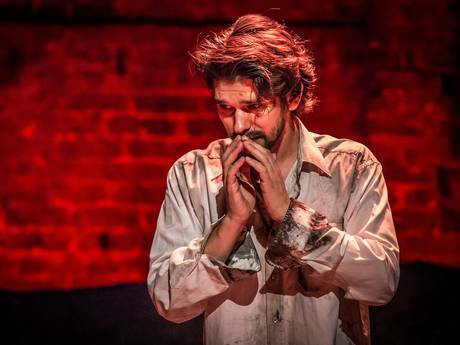 His interaction with Ben Whishaw’s Dionysus is passionate and drives the play forward. Audience members who have seen Bertie Carvel in Matilda might experience a slight déjà vu towards the end of the play. Some might say he looks too comfortable dressed up in women’s clothing but personally I think this just adds to Pentheus self-assurance. He is absolutely sure about himself, his values, decisions and ideas and not even women’s clothing can change that. Kevin Harvey joins Ben Whishaw and Bertie Carvel but does not get the opportunity to stand out. The pure stage presence of Whishaw and Carvel alone is enough to command the audience’s attention and Harvey’s roles are simply too small to make a proper impact. 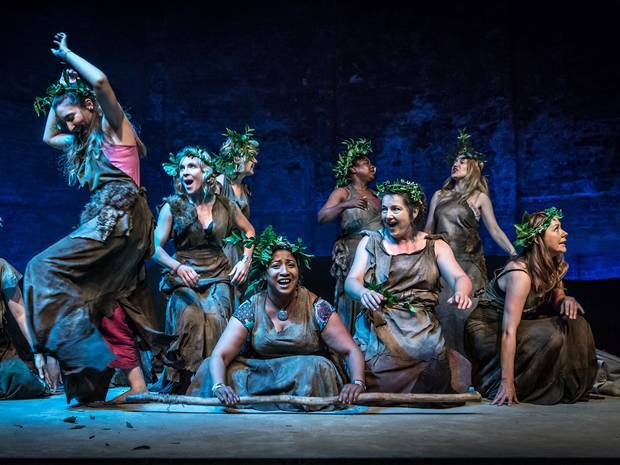 Bakkhai is one of the greatest Greek tragedies and being performed in a traditional way this production also features an all-female, all-singing chorus. And while their harmonies are impressive the action grinds to a halt whenever the chorus appears. As beautiful as the singing is it becomes tiresome after a while. One single sentence from Ben Whishaw’s Dionysus spoken with terrifying assurance and command leaves more impact than a five-minute chorus interlude. This production without a doubt centres around its two “stars” who unleash a tour de force on stage. Ben Whishaw and Bertie Carvel are what makes this production truly interesting to watch. These are two of the best stage actors of our generation at work and it is a joy to see them in such an intimate venue bringing Bakkhai to life. 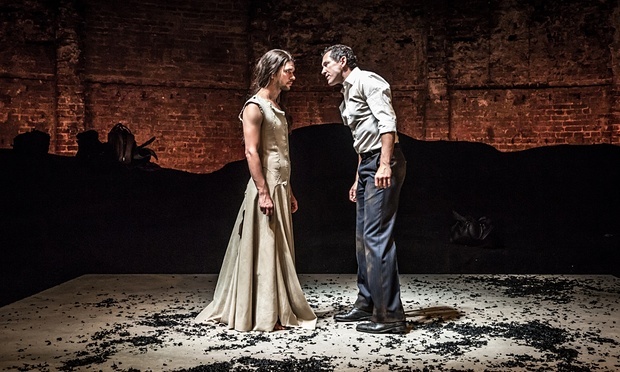 Bakkhai runs at the Almeida Theatre until 19th September. For more info and to book tickets click here.